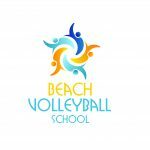 Below are the basic beach volleyball techniques which are used in the sport. Click on the title to open up a description and then the image to enlarge. Used to receive the ball when served, attacked or just played over the net by the opponents. The hands are brought together and gripped with the thumbs up, the arms are straight and form whats called the platform. The ball is played up with the legs not swinging the arms like a bat. One of the most commonly used moves in beach volleyball. A must have move. Used to defend the ball which is attacked by the opponents fast into the court. 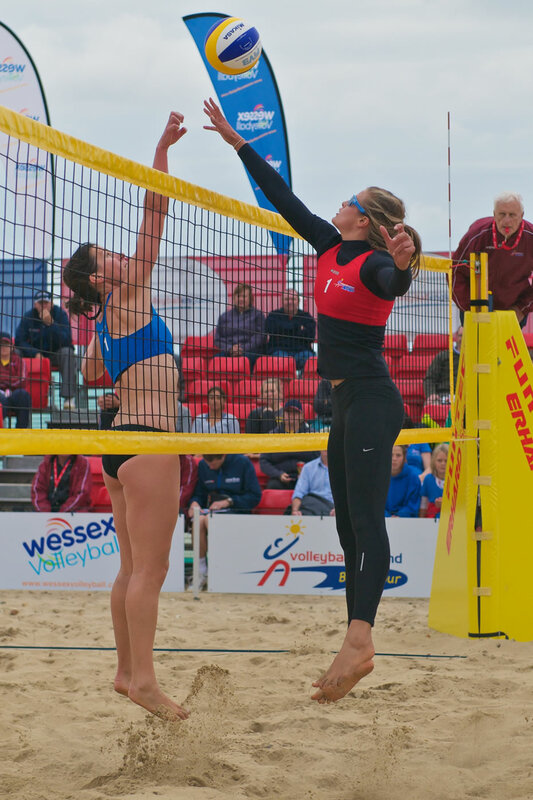 Paying the ball low and close to the sand allows a player to defend the ball then pick themselves up ready to attack the set ball. It is also used to retrieve any ball which can only be retrieved by diving. After the dig which lifts the ball ideally up and forwards towards the net comes the set. The set can be done in two ways, pictured here is the dig set, the platform is more raised and parallel to the floor and lifts the ball up and high close to the net for your partner to spike the ball. Played over hand above the forehead, bending the knees and elbows. Using a spring like action when the ball lands on the finger tips, the player lets the ball land and immediately pushes the ball out and upwards high into the air aiming the ball close to the net for their partner to spike the ball. A single handed shot like a smash in tennis or badminton played over head. The player aims to jump and hit the ball above their hitting shoulder with a straight arms, letting the wrist snap, adding top spin and speed to the ball. Used to attack the ball at the net when the ball is set too close and the player may hit the net band with a usual swing from a spike. Using the first two fingers, bent at the knucles using the flat face, a very effective attack shot and used to replace the indoor tip, which isn’t allowed on the beach. Used to stop the spike attacked ball at the net. Jumping up with two hands the block aims to get their hands over the net to rebound it back quickly into the opponents court. A block may not touch the top net band but they can have their hands over the net after the opponents have spiked the ball. Used by the media to attract more questionable interest into the sport, but actually used to communicate to your partner, which area you will be covering when jumping up to block at the next or will defend in the back court. Used to introduce the ball into play, behind the base line. Throwing the ball up with one hand the arm draws back and then the elbow comes forward and then catapults the wrist towards the ball, contacting the back of the ball with a flat hand. A jump float serve is used to introduce the ball into play, jumping from behind the base line a player may land into court after they have served. Jumping and attacking the back of the ball with a flat palm. Driving the ball low over the net with out spin and making it hard to receive. All photos on this page © Steve Smith.